Mario and Luigi in Stardust Fields battling two Bill Blasters in Mario & Luigi: Superstar Saga + Bowser's Minions. The Stardust Fields are the border region between the Beanbean Kingdom and the Mushroom Kingdom. The place is a purple field that contains barrels and fallen stars, and a perpetual night sky in the fields. 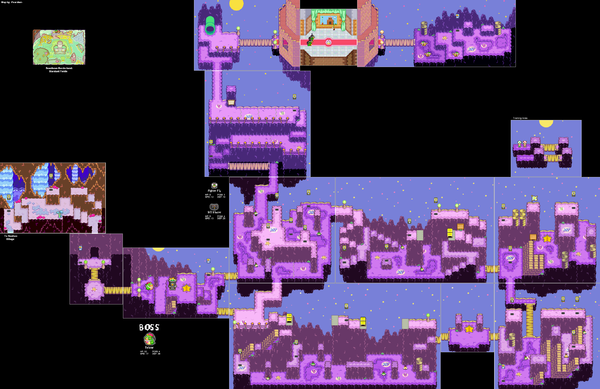 The Starshade Bros. occupy the area in some manner, having access to several underground areas with star-shaped entrances. 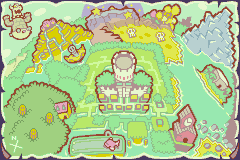 The area is mostly in the Beanbean Kingdom, though a small portion of it (called the Beanbean Borderlands) is in the Mushroom Kingdom. The Beanbean Borderlands is the first place that Mario and Luigi visit when Bowser's Koopa Cruiser crashes. The border between the two kingdoms is guarded by the Border Bros, and to cross the border, travelers must complete a round of jump rope in a minigame called Border Jump. Mario and Luigi can also return to do the Border Jump again in exchange for Hee Beans, though they won't be allowed to cross back to the Mushroom Kingdom side. Once in the Beanbean Kingdom proper, Mario and Luigi meet the large Tolstar. They had to free Bowser from Tolstar's cannon by giving him 100 Beanbean coins. To gain more coins, Mario and Luigi go further into the fields, where they also learn how to Spin Jump and High Jump from the Starshade Bros.. After collecting enough money and giving it to Tolstar, he reveals that he had lied about freeing Bowser simply to be greedy, and then attacks them. Once Tolstar loses, Sergeant Starshade comes back out, irritated by the noise of the battle. He lights the cannon Bowser is in, launching him away. Afterwards, Mario and Luigi head to Hoohoo Village. In addition to the items listed below, Hee Beans can be obtained by playing Border Jump. Beanbean Map Given by the Border Bros. after Mario and Luigi are just about to leave. Mushroom In the ? Block in the northeast of the Z-shaped path screen in the north. In the ? Block in the southwest of the Z-shaped path screen in the north. One screen to the northeast of the Tolstar screen, in the ? Block in the southwest of the high area. Two screens to the northeast of the Tolstar screen, in the ? Block above the small bump in the southwest. Three screens to the northeast of the Tolstar screen, in the ? Block in the northeast. In the cave between Stardust Fields and Hoohoo Village, in the ? Block on the high platform in the north. In the cave between Stardust Fields and Hoohoo Village, in the ? Block in the northwest. Syrup Three screens to the northeast of the Tolstar screen, in the ? Block in the southwest. Three screens to the northeast of the Tolstar screen, in the ? Block in the northwest. Three screens to the southeast of the Tolstar screen, in the right ? Block on the northeast platform. In the English version of Mario & Luigi: Superstar Saga, the Mario Bros. meet the Starshade Bros. in Stardust Fields Area 64. In the Japanese version, they meet them in Area 51. This is a reference to the Nintendo 64 and the secret military facility located in the southwest United States, respectively. When Mario jumps on Bowser prior to meeting Tolstar, the coins that pop up aren't just for show; the player is actually awarded 3 coins. This is to prevent the player from having 0 coins to give to Tolstar, which would otherwise be possible by running away from enemies until the player is out of coins. This page was last edited on March 25, 2019, at 06:45.